Historians have documented the arrival of black people in Britain as members of the Roman Army. The first reference to a black African in Britain in the historical record is at a Roman military settlement at Carlisle, in ca. 210 AD. Shortly after, in the years 253-58 AD, Hadrian’s Wall on the Empire’s northern frontier was guarded by a division raised in North Africa. Other Africans were brought to Britain at various times although the continuous presence of black people in Britain is traced to 1555, when Africans arrived in the company of a London merchant. 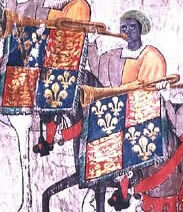 John Blanke, a black trumpeter, was a regular musician at the courts of both Henry VII and Henry VIII. Musicians’ payments were noted in the accounts of the Treasurer of the Chamber, who was responsible for paying the wages. There are several payments recorded to a “John Blanke, the blacke trumpeter.” This trumpeter was paid 8d [8 pence] a day, first by Henry VII and then from 1509 by Henry VIII. When a son was born to Henry VIII and his wife, Catherine of Aragon, on January 1, 1511, the royal family ordered a major celebration of a royal birth. The two-day Tournament of Westminster held later that year provides an account of a black musician who is assumed to be John Blanke. He appears twice on the Westminster Roll manuscript depicting the tournament: once on the way from the court and again on the way back. According to the historian Sydney Anglo, he is almost certainly John Blanke, the “blacke trumpeter” mentioned in the Treasurer’s accounts. In 1596 Queen Elizabeth I proclaimed the number of “blackamoors,” or people of African descent, excessive and ordered their expulsion. However the Queen’s own employment of a black entertainer and a black page are said to have undermined the deportation effort, and it ultimately failed.